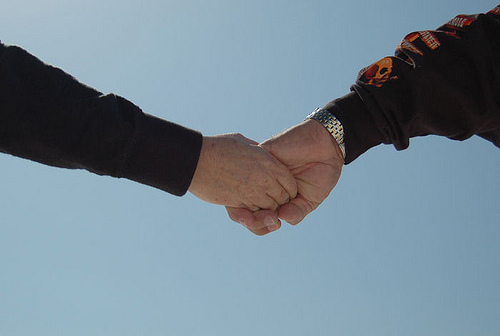 Hands Across the Sand is a movement made of people of all walks of life and crosses political affiliations and the borders of the world. This movement is not about politics; it is about the protection of our coastal economies, oceans, marine wildlife and fisheries. The accidents that continue to happen in offshore oil drilling are a threat to all of the above. Expanding offshore oil drilling is not the answer, embracing Clean Energy is. Let us share our knowledge, energies and passion for protecting our planet from the devastating effects the burning of filthy fuels and offshore drilling present. On June 25, 2011 the people of the world will join hands to champion clean energy solutions to our filthy fuels problem. Embracing a clean energy future now is the path to a sustainable planet. Click HERE to find an event near you, or to help organize an event in your area. On a local, national and global level, Joining Hands sends a powerful visual message of human solidarity to our nation’s leaders. We are unified in the defense of the air we breathe, the water we drink and the food we consume from dangerous, dirty energy sources. Every time we join hands that message is reinforced. It’s simple and logical. Embrace clean energy. A line in the sand is a powerful thing. Have you heard about Beachapedia? Beachapedia captures decades of experience and knowledge gained by Surfrider Foundation activists, scientists and staff through hundreds of environmental and educational campaigns on our coasts. By sharing this resource with the public they hope to provide tools and information to help communities make a positive impact on their local beaches. 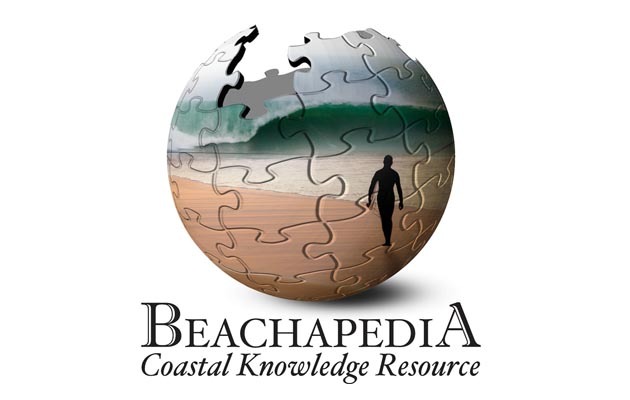 With cool features like the “Coastal Factoid” of the day and continually-updated “State of the Beach” report, Beachapedia is an awesome resource for anyone and everyone who loves the beach, ocean, waters, or the environment. Good Video – Great Message! This video shares the story of the Anna Maria Historic Green Village, the pioneering sustainable development and one of the most exciting projects Anna Maria Island has seen. Click HERE to view some great vacation rental properties on Anna Maria Island! Through the Historic Green Village, we aim to create a new standard for sustainability by developing the first LEED Platinum and the first Net Zero Energy campus in the Florida. LEED means Leadership in Energy and Environmental Design and is a rating system with certification for “green” buildings developed by the Green Building Environmental Council of the United States (USGBC) and provides certain environmental standards for construction. Being Zero Net Energy, means the Green Village, will generate more energy on-site than it will consume in a given year. The Green Village covers 6 lots on Pine Avenue in Anna Maria City and when completed, will contain 7 commercial buildings and 2 rental units. Our goal is to showcase the best in sustainable design and technologies while maintaining the unique charm of our historic seaside community. Over the last six month we have planned and designed a wide range of strategies and technologies that demonstrate how we can foster a sustainable future while preserving the historic charm and scale of Anna Maria Island and set a new benchmark of performance in energy, water and sustainable design. REUSE & RECYCLING on a big scale – historic buildings, recycled materials, low-emitting paints, sealants and solvents, and a range of other sustainable design choices and material selections choices that reflect our desire to have minimum impact on our environment. We hope that you might find this video interesting in regard to the projects and programs you are currently involved. For more information, please visit the Anna Maria Historic Green Village Website. They invade our homes, lurk in our backyards, wander our streets, swim in our ocean, float down our rivers and streams, and find shelter amongst trees and bushes. They are found in the most populated and the most remote places on Earth. They need no resources to persist and may indeed outlive the human race. We cannot ignore them, we cannot escape them and we cannot destroy them. So what can we do? We can stop producing them. Single use plastic grocery bags are the most widely distributed product in the world. The average family accumulates hundreds of plastic bags per year without realizing the harm single use plastics cause to humans, animals, and the environment. In fact, it is estimated that, world-wide, approximately one billion plastic bags are used every minute! It is easy to think of plastic bags as free, abundant and disposable tools for improving our quality of life. They are in fact environmentally expensive; one cost is that both land and ocean animals die from entanglement or ingestion of plastic bags. They are persistent; plastic bags can take up to 1000 years to photo-degrade (break up into small pieces), and do not ever biodegrade. And they reduce our standard of living; plastic bags disrupt our appreciation of nature’s pristine landscapes. More significantly, they clog storm drains, increasing the chance and severity of flooding during rainy seasons. The overwhelming prevalence of plastic bags on Earth has created a problem so extensive that many countries around the world are taking action to prevent plastic bag distribution. As early as 1988 environmentally minded people realized the costs of single use plastic bags far outweighed the benefits. By 1998, thirty Alaskan villages banned the plastic bag. Now, in 2011, multiple countries in Africa including: Kenya, Botswana, Rwanda, Uganda and South Africa have banned the plastic bag. African countries are not the only ones catching on: Bhutan, Brazil, Italy, Macedonia and Taiwan have all instated plastic bag bans. Multiple cities in the United Kingdom, France, India, Canada, Australia and the United States have also officially banned plastic bags. And those are just the places that have prohibited plastic bag distribution. Many other countries such as Belgium, Denmark, Germany, Ireland, Israel and the Netherlands, have implemented a plastic bag tax to slow the proliferation of the bag. There is clear evidence that taxes and bans do reduce the amount of single use plastic bags in the environment. In 2002 the government in Ireland introduced a plastic bag fee called PlasTax. The law resulted in a 90% reduction in plastic bag consumption, a huge reduction in plastic bag litter and a significant decrease in oil use. Individual corporations and companies have proven that they can make a difference too. Whole Foods Market banned plastic bags on Earth day in 2008 and has since estimated that reusable bag use tripled in just one year! Here in California, we are fighting for change with hope and determination. In 2007, San Francisco jump started the bag-ban trend in the United States. Upon learning that plastic bags cannot legally be taxed in California, San Francisco became the first city in the state to pass a full ban on non-biodegradable plastic bags in major grocery stores and pharmacies. Since San Francisco’s legendary decision to ban the bag, a cascade of anti-bag campaigns aiming to eliminate single use plastic grocery bags have swept through California. A few other California cities that have effectively “banned the bag” include Malibu, Fairfax, Palo Alto and San Jose. In November 2010, Los Angeles County passed a plastic bag ban affecting unincorporated areas, but as the ban is not applicable to LA cities, the cities are currently working for bag bans independently. On January 25th 2011, Marin County Board of Supervisors unanimously passed an ordinance that will ban plastic bags and charge a five cent fee for paper bags beginning in 2012. Also in late January, Santa Monica approved a ban that will be enacted in September of this year! Calabasas joined the many cities striving towards sustainability by eliminating plastic bags in February. Most recently, Albertson’s in Carpinteria has agreed to run a pilot program that will test the practicality of banning plastic and paper bags from all Albertson’s stores. Albertson’s is not the first corporation to take this approach. Although battles are being won at the local level, the opposition is not going down without a fight. Oakland, Fairfax and Manhattan Beach have all met major resistance by the American Chemistry Council, the main proponent of single use plastic bags. The Save the Plastic Bag Coalition, as well as the Coalition to Support Plastic Bag Recycling have both filed and won lawsuits against the cities, claiming that the bans were passed without sufficient Environmental Impact Reports. While plastic bag bans enacted by Oakland and Manhattan Beach are currently ineffective due to this complication, Fairfax avoided being sued by passing a voter initiative to ban plastic bags. Small-scale successes have given us the hope and the knowledge essential for large-scale change. Although Californians’ previous campaigns for a statewide ban have failed, defenders of the environment are not giving up. The movement away from single-use plastics and towards sustainable practices is continually gaining speed. Education campaigns and recycling programs are steps in the right direction, but statistics have shown they are not enough to change shoppers’ behavior. Experience is telling us that in order to get results, make the plastic bag a valuable commodity, or get rid of it. At Ocean Futures Society we support banning single use plastic bags because we stand behind the principle, “There is no waste in nature.” This means that in nature everything is recycled in one way or another. Even the harmful chemical defenses of plants and animals are naturally broken down in to harmless raw materials that become available for reuse in another form. With this valuable lesson from nature we conclude that we should only produce materials that can be easily rendered harmless after use and then become raw materials for another use. We strongly believe it is crucial to stop producing disposable plastic bags that create waste neither humans nor nature can adequately dispose of. There are more environmentally friendly materials that can be used to carry our groceries and belongings. We are not against the use of durable plastic for long-lasting products, it just does not make sense to use a plastic bag for ten minutes to carry our groceries and then throw it away, liberating it to linger on our planet for thousands of years. We are smarter than that. But it takes a willingness to create change. We need to rise up the challenge and support those companies and cities that are moving in the right direction; the direction we need to follow so we can all enjoy a more sustainable future. 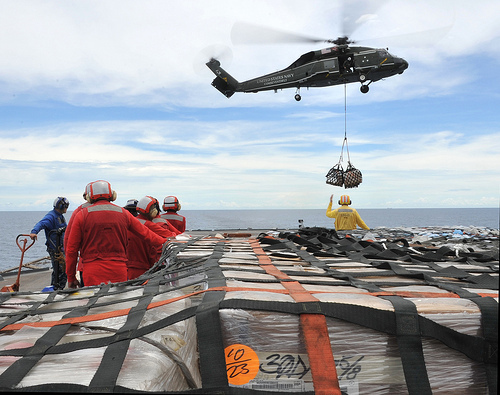 Helicopter moves supplies to USS Blue Ridge from USNS Rappahannock while enroute to Japan. Click HERE for ways to help those affected by Japan’s Earthquake & Tsunami. The Greenest Christmas Tree in Florida! PineappleFish wanted to celebrate the holiday season with a beautiful tree at the site of the Anna Maria Green Village, but of course, being Green they did not want to use electricity to power the lights. The Result? The first Zero Net Energy Tree ever seen on Anna Maria, with power for the lights generated by the sun! Tom Stockebrand, their solar expert, took a very simple solar panel, generating 175 W of energy over 5 hours. 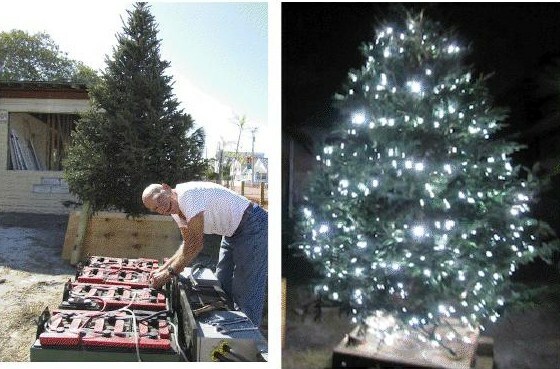 He hooked it into a bunch of 24-volt batteries to store the energy and an inverter, which converts the energy into an electrical current to turn the tree lights on. Then they set the tree lights onto a timer – from 6pm to 11pm each night. Only 5 hours of sunshine charges the batteries! They switch the lights on when the sun goes down and get 5 hours of electricity to light the lights! The panel actually generates more than they need because the tree lights don’t need very much (and Florida has plenty of wonderful sunshine). Click HERE for more information on the Anna Maria Historic Green Village and all of the Green initiatives on Anna Maria Island. Beachhouse.com homeowner and owner of Mermaid Cottages, Diane Kaufman, has combined 2 of her loves – property management and dogs – in her latest “pet” project, Beach Bum Biscuits. These delectable all-natural bakery-made dog biscuits are currently on sale in Tybee Island, Georgia at Seaside Sisters, and will soon be available in a beach town near you. 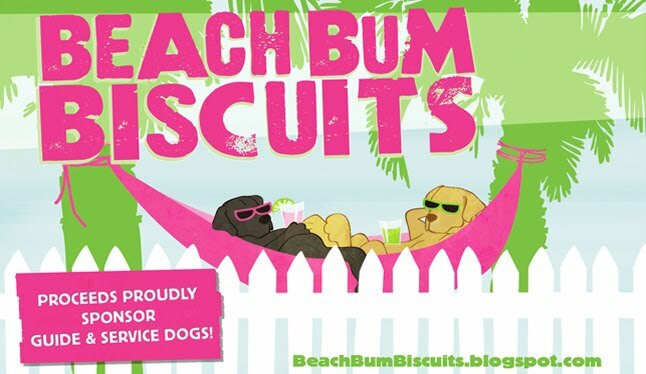 As if you needed any more reason to spoil your furry friend, proceeds from the sale of Beach Bum Biscuits also go to support service and guide dogs! Also, by staying at any Mermaid Cottage vacation rental property, you help to support 2 great guide dog foundations: the Southeastern Guide Dogs’ Puppy Sponsorship Program, and The Guide Dog Foundation for the Blind. 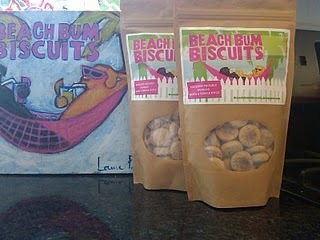 Stay up to date on the latest Beach Bum Biscuit news by following their blog! Beach Bum Biscuits are also a great Holiday gift for your pet or that special pup in your life! To order in time for the Holiday’s, contact Diane at: Diane@MermaidCottages.com or call her at: 912-313-0784. 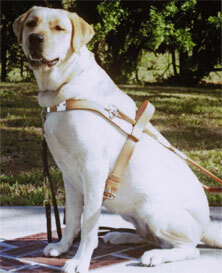 Clarke is one of the first dogs we sponsored who trained at Southeastern Guide Dogs’ School in Palmetto, FL. Clarke has proven to be easy going, extremely comfortable with people of all ages and very quick to learn new tasks. 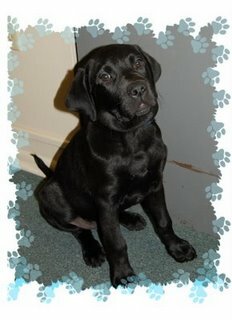 We are all hoping for a great career for her as a guide dog for a deserving blind individual. 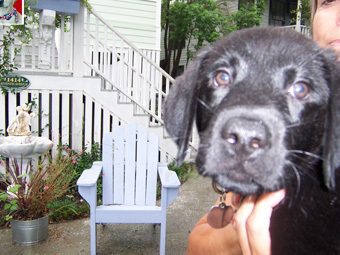 Clarke is also from the Southeastern Guide Dogs Program. (Update) It is with great joy we tell you that Clarke was matched in June 2009 with her blind partner, Joyce. They both are quite laid back and easy going and from all appearances will be great companions for a very long time. Clarkes’s truest challenge might be living with Joyce’s six birds!! No doubt, she’ll do just fine. 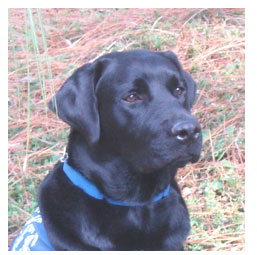 Tony is one of our newest guide dog sponsees for spring 2009 from the Southeastern Guide Dogs Program. Our update on Tony is that he is a great pup! He will be a year old in November. He is sweet and has a great work ethic. He lives with his new owner’s other dog, Sherlock, who is 8 years old. They go to work together, play and enjoy each other’s company. Tony is a beautiful black lab, who loves to please. Berkeley is our newest Service Dog from the Guide Dog Foundation for the Blind, Inc since Fall of 2009. Here is a great pic of him at Diane’s cottage. Come Party with Us and Adopt a Shark! Join Beachhouse.com at The Great Shark Affair, a special public awareness event demonstrating the effects of our actions on our oceans, coastlines, bays, reef systems, and the blue eco-systems. Enjoy delicious gourmet food and beverages while learning about sharks & our oceans, bidding on auction items and playing “Shark Jeopardy”! You should also check out AdoptAShark.com is a fun way to make a difference, learn about the ocean ecosystem, and get involved in conservation. Not only can you actively contribute to their preservation, you can actually track and name your own real, living shark! Why protect sharks? Sharks are an essential part of the ocean’s food chain, and they are currently threatened by overfishing, finning and bycatch. They are needed to maintain balance by preying on sick and weak animals, preventing the spread of disease and keeping population sizes in check. These creatures seem to have an ability to resist cancers and other diseases, and further research may yield lasting benefits to all humans. Your Adopt a Shark donation is used to purchase new tags for continued research on the movement and behavior of sharks. 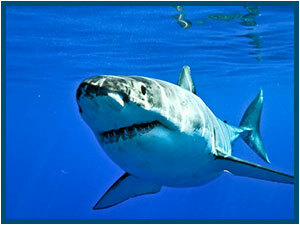 You will learn about and be able to see tracking maps of your shark, depending on when and how the shark was tagged. If your tag is “live”, each day you can come back to our website to see where your shark is, and if any new information has been posted about your shark. Satellite track can show movement of your shark for 3-6 months! In addition, you will also receive a Shark Adoption Kit, including an Adoption Certificate, a picture of your shark, an Adoptashark T-shirt, information about your shark, and lots of fun stickers and activities! What can else can you do to help? Avoid shark products, make responsible seafood choices, keep our beaches and oceans clean, write your government representatives to protect sharks, and spread the word to raise awareness! 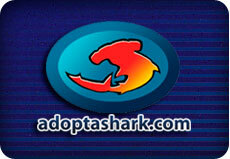 Click HERE to adopt a shark now, or find them on Twitter & Facebook! We love finding great companies and organizations to blog about. And even better when the company or organization incorporates a great cause and the travel or vacation rental industry! We just came across Vacation Homes for Charity, a great organization that partners vacation rental homeowners with charities in need. 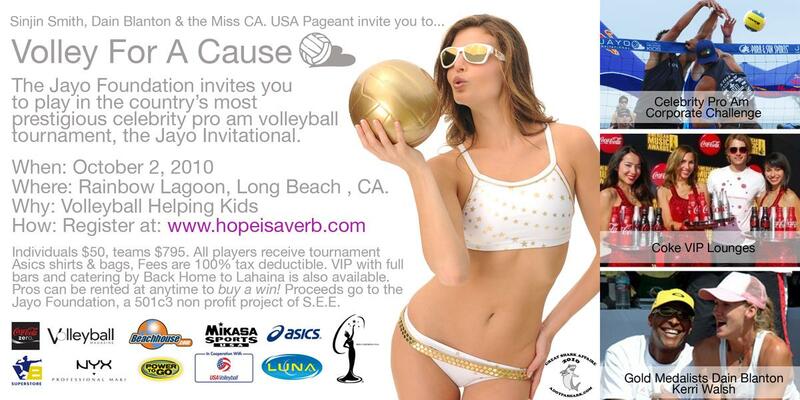 “There are 1000′s of charities in dire need of live auction items. Our goal is to make the process of donating time at a vacation home to a charity easy and efficient for all parties. In the fall of 2008, we at The Society opened up our platform to help charities source vacation homes for their auctions and other fund raising events. We tested this new service in the fall all parties including homeowners, property managers, real estate brokers, and charities were delighted. If you own a vacation home or know someone with a vacation home, you can CONTACT them or REGISTER today! Before you donate your rental property, be sure that you’re up on the latest tax regulations in regards to what you can and can’t write off. For information on the tax benefits, you can check out this ARTICLE. The other night, my friend came over for dinner and, being the great friend that she is, she also brought along a bottle of wine…and not just any wine. An avid reader of this blog (thanks K!) she knows that the Surfrider Foundation is a frequent topic of conversation, so she brought a bottle of Surfrider Chardonnay! I know…who knew they even made that?! Well, technically, Surfrider doesn’t make it. Rosenthal – The Malibu Estate winery is responsible for this delicious wine. And even better, 85% of the fruit used in the wine was grown in the Edna Valley of San Luis Obispo where I grew up! After a glass (maybe 2…) I started researching for this post. Turns out Rosenthal has a whole line of Surfrider wines: a 2007 Surfrider Chardonnay, a 2005 Surfrider Red,a 2008 Surfrider Sauvignon Blanc, and even a 375 ml 2005 Red Dessert Wine. It’s a pale straw-colored wine. The nose features a fragrant show of mainly tropical fruit and flowers. The palate is not belabored by wood, although it is 30% barrel-fermented, with five months in oak. In fact, it feels quite clean and crisp in the mouth. The fruit comes from Edna Valley, not Rosenthal’s Malibu estate, which may explain some of the minerality. I even noticed a slight effervecsence on the second day which I didn’t see in the previous night’s glass. I’m a big fan of Chardonnay with a hint of oak, but I also love a refreshingly unoaked variety. Surfrider falls somewhere in between. I’m glad I could hang five – fingers, that is – on a Surfrider Chardonnay. 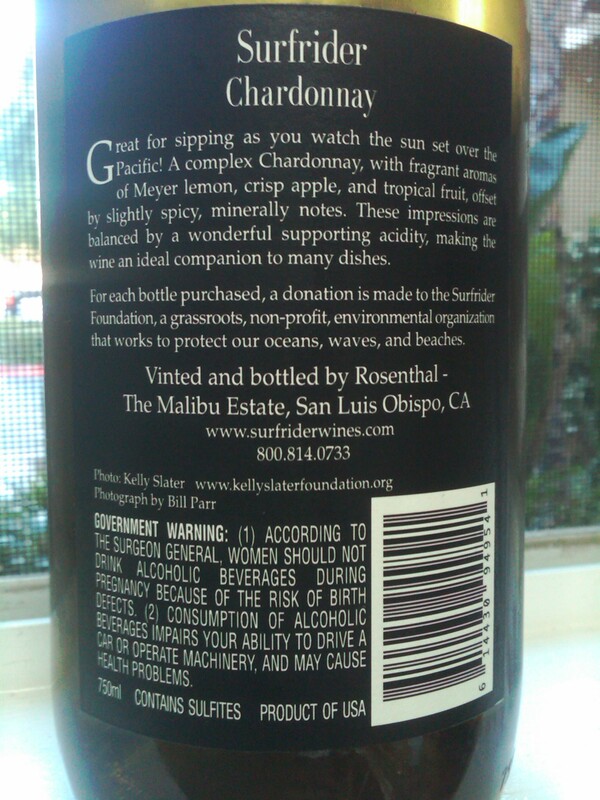 Rosenthal supports the Surfrider Foundation by donating a portion of the proceeds from the sale of each bottle. Now you don’t have to feel guilty about having that glass of wine…you’re helping to keep our oceans and beaches clean! Cheers! This year marks the 7th year of supporting the local San Diego Surfrider Chapter. Admission includes a souvenir taster glass and 5 samples. Tickets are $25/pre-sale and $30/at the door. 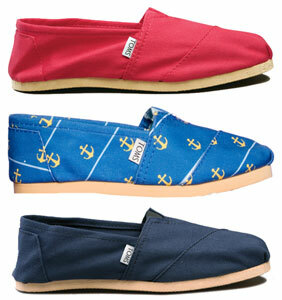 All proceeds go directly to the Surfrider Foundation, San Diego Chapter. Interested in becoming a Surfrider member? Buy a ticket to the event and a 1-year membership for only $40 a $50 value. On-line pre-sale ticket sales end at 2:00p on Friday May 7th. Tickets will be available at the door on May 8th for $30 each. Free shuttles starting at 1:40pm are available from Pacific Beach and Ocean Beach and will run throughout the event. The PB pick-up/drop off point is at the corner of Dawes/Thomas at the edge of the PB Library. No event parking is available at the Library, so plan accordingly. The OB pick-up/drop off point is at Dusty Rhodes Park. Karl Strauss Beach to Brewery from Love Machine Films on Vimeo. TOMS (you know, the awesome shoe company that donates a pair of shoes to a child in need every time you buy a pair of their shoes) has declared that TODAY, April 8th is One Day Without Shoes Day! Below is some information from their Website about the day, the cause and the solution. Through everyday encounters with domestic poverty, we are reminded to appreciate having food and shelter, but most of us all but forget about our feet. Food, shelter, AND shoes facilitate life’s fundamentals. Imagine a life without shoes; constantly aware of the ground in front of you, suffering regular cuts and scrapes, tending to infection after each walk, and enduring not only terrain, but heat and cold. The problem is large, but the solution is simple. Wearing shoes and practicing basic hygiene can prevent both infection and disease due to unsafe roads and contaminated soil. By imagining a life barefoot, we can all contribute to the awareness of these conditions. On April 8th, communities, campuses, organizations, and individuals are banding together to walk barefoot for One Day Without Shoes. Take a walk with us on April 8th, 2010. In some developing nations, children must walk for miles to school, clean water and to seek medical help. Dubai Star Oil Spill in San Francisco Bay – How YOU Can Help! Kill the Spill (KTS) crew and Surfrider Foundation San Francisco, need your old Nylons and stockings! Help! Donate Your Old NYLONS & STOCKINGS This Week (Oct 31 – Nov 8)! If you spot any oiled wildlife, please contact Oiled Wildlife Care Network at 1.877.UCD.OWCN (1-877-823-6926). Up-to-date info about their current response to this spill can be found here.